GoGazzab, one of the youngest yet the fastest growing e-commerce start-up of Nepal, which is also the first Nepali online shopping company to venture in m-commerce. It has a huge variety of products from watches to refrigerator, allowing you to shop from anywhere at your convenience and each day you can find 100+ additional items. Recently, they have launched mobile application, where you will find information on an electronic products such as; Phones, Tablets, Office electronics and many more. 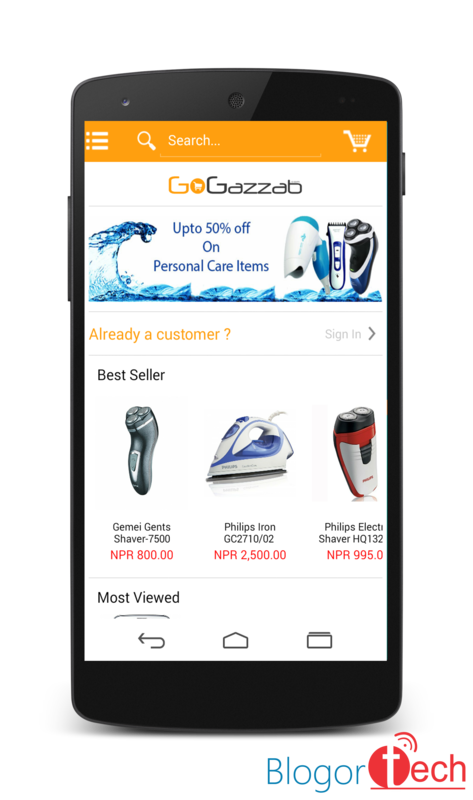 → GoGazzab, is a one stop shopping solution app for an electronic products at your convenient time and place, which is no doubt a cutting-edge online shopping platform in Nepal. Without much further ado, let’s get started. UI is satisfactory and has tremendous possibilities of improving it. For instance; Shopping cart icon is blurry. Where as in UX, there is no option for editing the order or once the order has been placed, you can’t cancel it unless you phoned to GoGazzab. Hope in next update, we can see order cancel button. Wide variety of an electronic products with unbeatable prices and also with its short description. Free Shipping. But if the order value is less than Rs 1200 then the charges is Rs 100 for delivery per item . While, orders of Rs 1200 or above are delivered free (Inside Valley). For out of valley orders charges will vary upon the distance and product weight. It provides complete information which ultimately help an end-user before buying any electronic products ranging from small appliances to large appliances. It also saves your product searching time with just few taps. Just tap on which product you would like to buy. Then, sit tight and wait for order confirmation call from GoGazzab and if you are inside the kathmandu valley then you need to wait for three days to get your ordered items at your doorstep and for out of valley it will take three-four days depending on your location. What’s your views on this app? As always, your feedback will be invaluable to GoGazzab team. So, for that you just comment below and we will redirect your feedback to them. CHEERS!